I’ve blogged many times about modern ways to display family portraits and create gallery walls. 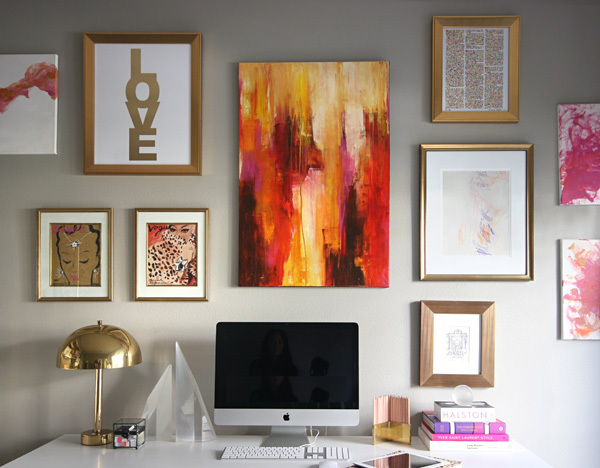 But what is your preferred way to display art? Hanging or leaning the photos. I personally LOVE the idea of leaning pictures for one, it’s not as permanent as hanging art. I know it’s nothing to fill holes left from nails but it’s an extra step one must take, especially renters when vacating property (after all, you want to get your security deposit back, just being real…) but it also is way faster. You don’t have to use rulers and levelers or go through THIS process of arranging a gallery wall or THIS technique when hanging photos. You can simply lean them from the floor, lean them from shelves, lean them from desks. Even if you have the same sized photos, all you have to do is get various sized frames and mats for those frames and then the photos will be viewed at different heights. Previous Post Common Denominator: What’s similar in each interior? Next Post Saturday Sunday Shindigs: Let the Holiday Festivities Begin….